First of all I love your column and it is the main thing that inspired me to start barbell training. I’ve been doing Stronglifts for 10 weeks and I’m starting to fail on my lifts for the first time 🙁 I know intellectually that it’s part of the process but it bums me out! 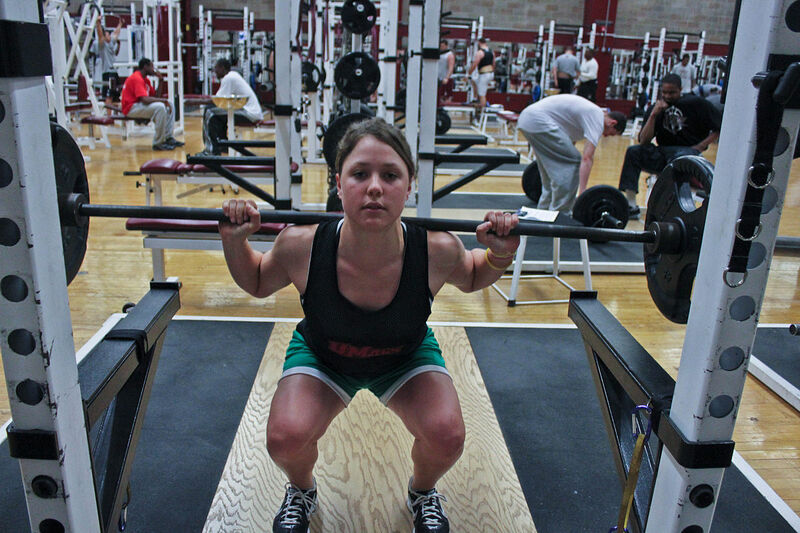 I am especially having trouble with my mental game when it comes to deadlifting. I recently lifted 200×5 (I weigh about 200 pounds) but when I went back the next week to lift 205 I could only get one rep in. I have been really, really focusing on my form and my warmup sets feel good, so it feels like my problems are partly mental. I’m afraid of the heavy weight and convincing myself that I can’t do it. How do I get my mental game in check and keep making gains??? While you obviously might know better what’s going on with you than I would, I can’t stress enough—I feel like I say it in every column—that everything else that is going on in rest of your life will reveal itself in lifting. Tiredness that does not reveal itself in any other way reveals itself to me when I’m lifting. I’ve been pretty blessed in terms of how PMS affects me, such that I don’t usually feel tired. But in the days before my period starts, I weirdly fail lifts, fail last reps, fail weights I’ve done before. I often don’t even realize what’s going on until I look at a calendar several times and go, oh, duh, it’s my hormones. This applies to more than hormones though—the cost of too little food or sleep or too much stress may be ignorable in your day-to-day life, but you cannot lie about your level of self care to a deadlift. When you stand before the swole gods and ask for their judgment, you better come correct, my friend. This is not to say you have to be perfect at everything, but it’s worth examining what might be happening outside the gym that is tripping you up inside the gym. This is a very big thing that I love about lifting—if you are a meal-misser, a chips-from-the-snack-machine-dinner-er, a stay-up-til-3am-browsing-the-Instagram-explore-tab-er, a one-more-drink-can’t-hurt-er, a hours-of-circular-thoughts-about-whether-your-tinder-date-was-a-9/11-truther-er—the importance of doing the right thing for yourself and your body is no longer attached only to some nebulous concept of “long-term health.” It’s attached to this: you want to crush your lifts tomorrow? Eat a good, balanced meal. Stretch. See a therapist. Vape a little weed instead of drinking, but especially, go to sleep. Now—weights do get scary as they go up. 200 pounds is a lot! And pursuant to the stress aspect, there are going to be days when you can’t muster the focus or energy to do what you are supposed to do. This is also tricky because I don’t love the way that intro programs tell you to deal with failing, namely because there are a LOT of ways to deal and they tend not to go over all of them. However, what you do on the scale of a single session doesn’t super-matter, so they are probably just trying not to confuse you. So, at the risk of confusing you, there are couple things you can try. If you psych yourself out on one attempt, let yourself rest at least 3-5 minutes and then give it another shot. Failing feels bad, but it can happen for a lot of reasons even to experienced people on weights they’ve lifted before very easily—their setup wasn’t tight enough, they hit a bad groove, some random pain struck them out of nowhere. This also goes back to prep outside the gym, though—I absolutely cannot go in and deadlift 300 any day, even if I’ve lifted it at some point before. I have to follow a program for at least 4 weeks to peak myself there. Retrying the set, especially for deadlifts and especially if you fail on the very first rep, is fine. Next, (this is not likely to be the case for you at this point, but it might be for others) things do get to a point eventually where progress slows down. When that happens, you can slow down the rate of progress—5lbs instead of 10, 2.5 instead of 5. I think some programs would not tell you directly to do the following, but I don’t see any reason to not do it and don’t think it’s the worst thing in the world—if you failed 205 on the second rep, tried it again after a rest, and failed again, I’d suggest taking 5lbs off and trying 200. If you can do that no problem, the next week you should check with yourself on all aspects of recovery and try 205 again next week. If you can’t even do 200 on your third try, it’s even more likely that recovery that’s the problem. (The framework for taking weight off the bar is supposed to be after failing three workouts in a row, but since deadlifts only happen once a week in most beginner programs, that feels like a long time to not try and experiment any more with an issue, to me). If you do just keep failing, deload (take 10% off the weight and spend a week doing that). You will not go perpetually backwards just because you go a little backwards one week. This is hard to understand if you haven’t been through or seen a layout of more advanced lifting training, but numbers going up and up every session and lifting as much as you possibly can is actually a pretty rare and special time in the big picture of lifting. Most people who have been doing it consistently for six months to a year stopped seeing that kind of progress a while ago, and they deload every month or so. Deloading is part of a shame cycle in starter programs, but in the real lifting world it’s just a fact of life. You are not at that point yet, but it at least helped me to understand once I started failing on my Starting Strength progress that there is more to the notion of “progress” than the raw number of pounds you are lifting. There is the number of reps (200 pounds for 3 is better than for 2), number of sets (5 sets of 2 is better than 3 sets of 2), quality of reps (a pretty, tight squat is better than a sloppy, grindy one) and how you feel (200 pounds may feel like nothing one week and the heaviest thing in the world the next). Even if you DID lift that 205 pounds, but it felt like garbage, and you came back the next week and lifted it and it felt easy, that would be progress. You won’t always get a chance to lift your heaviest weight ever, but this is one reason it’s fun to take videos—even if your numbers haven’t substantially changed, your form is probably better, your confidence is higher, and maybe your reps are higher too. I realize that much of this probably feels like I’m not answering your question, but I think you have to trust me that, especially for someone who is just getting started, the mental aggression game across a 5-pound jump going from five reps to only one rep would likely be a pretty minor factor; rather, it feels more important for you to know that uneven performance is normal and it happens, and it is (necessarily, or even likely) your personal inability to have a stiff upper lip about it. Just remember that there a lot more to lifting than the raw number of pounds, both in what it means to you and how strong you really are, and how you do on any given day is not a statement about any of those things.